This image shows how iodide ions can make water more reactive, altering the reaction pathway during the discharge process. Image courtesy of the researchers. Battery researchers agree that one of the most promising possibilities for future battery technology is the lithium-air (or lithium-oxygen) battery, which could provide three times as much power for a given weight as today's leading technology, lithium-ion batteries. But tests of various approaches to creating such batteries have produced conflicting and confusing results, as well as controversies over how to explain them. 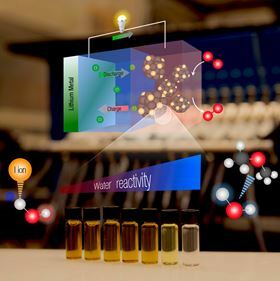 Now, a team at Massachusetts Institute of Technology (MIT) has carried out detailed tests that seem to resolve the questions surrounding one promising material for such batteries: a compound called lithium iodide (LiI). This material was seen as a possible solution to some of the lithium-air battery's problems, including an inability to sustain many charging-discharging cycles, but conflicting findings had raised questions about the material's usefulness for this task. The new study explains these discrepancies, and although it suggests that the material might not be suitable after all, the work provides guidance for efforts to overcome LiI's drawbacks or find alternative materials. The new results appear in a paper in Energy and Environmental Science. The paper is written by: Yang Shao-Horn, professor of energy; Paula Hammond, professor in engineering and head of the Department of Chemical Engineering; Michal Tulodziecki, a recent MIT postdoc at the Research Laboratory of Electronics; Graham Leverick, an MIT graduate student; Yu Katayama, a visiting student; and three others. The promise of the lithium-air battery comes from the fact that one of the two electrodes, which in lithium-ion batteries is usually made of metal or metal oxides, is replaced with air that flows in and out of the battery. A weightless substance is thus substituted for one of the heavy components. The other electrode in such batteries would be pure metallic lithium, a lightweight element. But that theoretical promise has been limited in practice because of three issues: the need for high voltages for charging; a low efficiency with regard to getting back the amount of energy put in; and low cycle lifetimes, which result from instability in the battery's oxygen electrode. Researchers have proposed adding LiI to the electrolyte as a way of addressing these problems. But published results have been contradictory, with some studies finding that LiI does improve the cycling life, "while others show that the presence of LiI leads to irreversible reactions and poor battery cycling," says Shao-Horn. Previously, "most of the research was focused on organics" to make lithium-air batteries feasible, says Michal Tulodziecki, the paper's lead author. But most of these organic compounds are not stable, "and that's why there's been a great focus on lithium iodide [an inorganic material], which some papers said helps the batteries achieve thousands of cycles. But others say no, it will damage the battery". In this new study, he says, "we explored in detail how lithium iodide affects the process, with and without water", a comparison which turned out to be significant. The team looked at the role of LiI on lithium-air battery discharge, using a different approach from most other studies. One set of studies was conducted with the components outside of the battery, which allowed the researchers to zero in on one part of the reaction, while the other study was done in the battery, to help explain the overall process. The researchers then used ultraviolet and visible-light spectroscopy and other analytical techniques to study the reactions that took place. These reactions can foster the production of lithium compounds such as LiOH (lithium hydroxide), instead of Li2O2 (lithium peroxide), in the presence of both LiI and water. LiI can enhance water's reactivity and make it lose protons more easily, which promotes the formation of LiOH in these batteries and interferes with the charging process. These observations show that finding ways to suppress these reactions could make compounds such as LiI work better. This study could also point the way toward selecting a different material instead of LiI to perform its intended function of suppressing unwanted chemical reactions at the electrode surface, Leverick says, adding that this work demonstrates the importance of "looking at the detailed mechanism carefully". Shao-Horn says that the new findings "help get to the bottom of this existing controversy on the role of LiI on discharge. We believe this clarifies and brings together all these different points of view." But this work is just one step in a long process of trying to make lithium-air technology practical. "There's so much to understand," says Leverick, "so there's not one paper that's going to solve it. But we will make consistent progress." This story is adapted from material from MIT, with editorial changes made by Materials Today. The views expressed in this article do not necessarily represent those of Elsevier. Link to original source. Scientists have discovered a new soluble catalyst material that can help expand the capacity of lithium-air batteries. Incorporating advanced catalysts made from 2D materials into lithium-air batteries allows them to hold up to 10 times more energy.